Because of the nature of the war being waged by the Islamic & Marxist Counter-States, Understanding the Threat (UTT) firmly believes this war will be won at the local level by citizens who understand the threat and understand the strategy to defeat the threat. UTT is the only organization in America empowering: (1) Police with investigative strategies to proactively identify jihadis, map out local jihadi networks, and take these networks down using the full force of the law; (2) Citizens with tools to map out the jihadi networks in their communities, and actions to take to engage local leaders in order to render the jihadis and their network ineffective; and (3) State/local leaders with strategies to dismantle the Islamic & Marxist Counter-States. Since 9/11/01, the federal government and the U.S. security apparatus has failed to fulfill its most basic duty – to secure the safety and liberties of the American people. Because the civil government and U.S. military leaders failed to identify the enemy based on U.S. war-fighting doctrine, the enemy’s strategy is succeeding. The United States lost the wars in Afghanistan and Iraq despite the fact our military boldly crushed Al Qaeda and other jihadi groups on the battlefield. In 2005, the U.S. Department of State wrote the constitutions for Iraq & Afghanistan creating Islamic States under sharia, thus achieving Al Qaeda’s stated goals there. Out of the four (4) leaders in the world keeping the Muslim Brotherhood and sunni jihadi organizations at bay – (Iraq – Saddam Hussein; Libya – Muammar Gaddafi; Egypt – Hosni Mubarak; Syria – Bashar al Assad) – the United States killed two (Hussein and Gaddafi), worked with the Muslim Brotherhood to remove one from power (Mubarak), and is working to remove another one right now (Assad). The Muslim Brotherhood calls this “civilization jihad” by OUR hands. They get our leaders to do their bidding for them. The man who was the senior Islamic advisor to President Clinton and in the White House more than any other muslim during the Clinton administration, created the Muslim Chaplain Program for the Department of Defense, and was a “Goodwill Ambassador” for the U.S. Department of State (Abdurahman Alamoudi), turned out to be a senior Muslim Brotherhood leader and financier for Al Qaeda who was involved in a plot with Al Qaeda operatives to kill Saudi Crown Prince Abdullah who became the Saudi King. Alamoudi is in federal prison. The U.S. Department of Justice and the U.S. Muslim Brotherhood’s internal documents identify the Islamic Society of North America (ISNA) as a “member of the U.S. Muslim Brotherhood” and a “nucleus” for the Islamic Movement which directly funds the designated Foreign Terrorist Organization Hamas. ISNA’s former President Mohamed Magid: (1) served on the Department of Homeland Security’s Advisory Committee and held a secret clearance; (2) was given an award by the Special Agent in Charge for Counterterrorism and the Assistant Director of the FBI’s Washington Field Office in 2005; (3) worked closely with President Obama’s administration; (4) was given the FBI Director’s Award in 2016 by FBI Director James Comey; and was publicly praised at Magid’s mosque by the Deputy National Security Advisor the President Denis McDonough. After being recruited out of the FBI by the Department of Defense at the end of 2008, UTT President John Guandolo briefed: numerous members of Congress – including the Chairmen of the Homeland Security, Intelligence, and Judiciary committees; several three and four star generals/admirals; former Directors of the FBI, CIA, and DIA as well as one former National Security Advisor; and a number of other government officials. None of these people were aware of the information presented at the time they were briefed. UTT’s President John Guandolo worked with Senator Jeff Sessions prior to the 2016 election and provided Mr. Sessions information identifying a man working inside Mr. Trump’s campaign as a jihadi. Because of this information and UTT’s efforts, that jihadi was removed from the Trump camp, and a second jihadi was prevented from getting in. Attendees of UTT training programs – including FBI Joint Terrorism Task Force agents/officers – report to UTT at the end of training courses they (1) were NOT aware of the information prior to the program, yet (2) the information is “critical” for protecting their communities. According to prosecutors and law enforcement officials in Arizona and Louisiana, two cases involving jihadis were initiated and prosecuted as a direct result of UTT’s training and consultation in the last two months (mid-January to mid-March 2019). Additionally, UTT’s training/consulting are responsible for an Al Qaeda operative being located, the prevention of new jihadi organizations being established, and a greater awareness of the Islamic threat throughout the United States. How is UTT’s success possible? By knowing the doctrine driving the enemy – sharia (Islamic Law) – and by understanding the Islamic network in the United States, their modus operandi, how they communicate their intentions, and how they interact with their Marxist collaborators, professionals can conduct predictive analysis and understand real-world events in ways nobody else can. It is like watching a 3-D movie without the glasses, and then having UTT hand you a pair of glasses. UTT educates many Americans and shares this critical information through many avenues. UTT publishes two (2) articles a week, provides a significant amount of free resources on our Research & Resources page of our website, produces a weekly 30-minute radio show, produces a high-quality TV show aired at WVWTV.com, has 6 DVD’s related to this threat available at the UTT online store, the book Raising a Jihadi Generation, and an upcoming book It’s All About Sharia. However, nefarious efforts by organizations inside the Marxist Counter-State impact UTT’s ability to continue its investigations and operations. These hostile groups include the traditional media, the Southern Poverty Law Center (SPLC), the ACLU, Hamas terrorists doing business as the Council on American Islamic Relations (CAIR), and others. In August 2014, 75 jihadi and Marxist organizations sent a letter to President Obama’s Homeland Security and Counterterrorism Advisor, Lisa Monaco, calling for the administration to silence UTT President John Guandolo and shut down UTT’s training programs. The enemy knows how effective UTT is. UTT is also the target of lawsuits meant to drain UTT of its precious resources. Members of Understanding the Threat’s team and their families are regularly threatened with physical violence in hopes UTT will, out of fear, stop speaking truth and defending liberty. We will not. UTT NEEDS DIRECT SUPPORT FROM CITIZENS! Share the work of UTT with others. Share our website UnderstandingtheThreat.com. Bring UTT training to your town (see “Capabilities” page on our website). Sign up for our Newsletter or visit our Blog page on our website. Purchase our books/DVD’s to learn and understand the threat. Use our free online resources. Listen to our weekly 30 minute RADIO show at www.WorldviewWeekend.com/radio, and share it with others. Watch our TV show at WVWTV.com and share it with others. Follow us on twitter @UTT_US, subscribe to our YouTube Channel (Understanding the Threat), like us on Facebook (UnderstandingtheThreat). 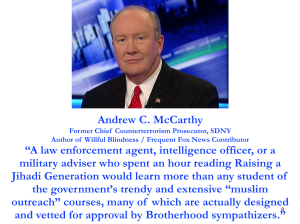 Purchase a copy of Raising a Jihadi Generation and give it to your pastor, police chief, sheriff, school board members, city council, mayor, state legislator, and anyone else you believe is open to hearing it! Attend UTT’s 1-week Train the Trainer program. This is the only program of its kind in the West and will give you the ability to teach about these threats and what can be done. See UTT’s “Capabilities” page here for more information. Pray for the UTT team, our Advisory Board and our mission. UTT has a lot coming at us and we need your prayers. America is losing this war badly and we cannot turn this war around until we Understand the Threat, and refuse to submit to the tyranny of Islam and Marxism. Join UTT as we take the fight to the enemy and put FREEDOM back on the offensive where it belongs! open borders and ports allow many to arrive at all entries. The 9/11 Commission Report.1st edition was quite accurate, but in the end, removed at the request of the believers with influence, the flowery books to follow were not so truthful. witnessing the freedom of speech is under siege, and seeing the power and influence of organizations a foreign doctrine is using foreign law to criminalize and distort language, I hope that the Presidential pen makes another heroic move and; stops the induction of the United States into the OIC and bans sharia law from the United States to stop the insidious move to replace the Constitution. The left has a fantasy and they will realize it too late. The moderates never last. This is my opinion…many places are not thrilled when it arrives but they consider it is their world to inhabit. Inasmuch as the 1934 opening of Islam’s first Mosque on American soil coincided with the 1935 dawning of J. Edgar Hoover’s 37 year tenure as Director of the FBI, it may be fruitful for UTTs intelligence team to conduct a juxtaposed analysis of the strategic & tactical similarities which may exist between sharia-adherent jihadists and the communists Director Hoover exclusively addressed in his revelatory book “Masters of Deceit”, perhaps to avoid offending the religious sensitivities of the time, while nonetheless concerned about Islam’s move west. And had it not been for zero tolerance which prevailed in America during the “Cold War” ’50s, e.g. for even insinuating that the 1st Amendments prohibition respecting the “FREE EXERCISE” (as opposed to the practice) of a religion was unwise in the context of national security — which it is, and will continue to be for the foreseeable future, I find it hard to accept that the most instinct-gifted law enforcement official on the planet at the time was oblivious to Islam’s vanguard in the American heartland, thus, though seemingly focused exclusively on Marxists, had a book on Islam’s warring* proclivities as well. *Anyone unfamiliar with Islam’s draconian plan for world dominance who hasn’t yet explored its declaration of war on the Western civilization grouping of victims (including the children), which in 2004 was seized in accordance with a federal search warrant from a subterranean basement in Annandale, Virginia by special agents of the FBI, may order a personal Arabic-to-English verbatim translated copy of the original document by contacting http://www.securefreedom.org to request (for a nominal handling & postage fee): GOVERNMENT EXHIBIT 003-0085 3:04-CR-240-G U.S. v. HLF, et al.